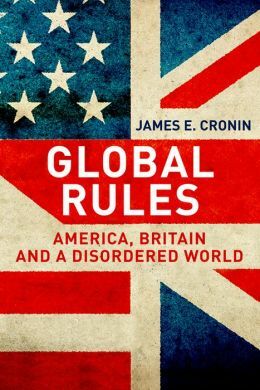 In a new book titled Global Rules: America, Britain, and a Disordered World (Yale University Press, 2014), Boston College Professor of History James Cronin charts the political relationship between the US and Britain and a new world order they created after the Cold War that continues today. According to Kirkus Reviews, Global Rules is “a well-researched, tightly presented study of government policies on both sides of the Atlantic.” A review in The Independent (UK) concurs, stating that Cronin “writes considered and balanced prose that respects the complexity of postwar history but which tries to make sense of the longer trends and important moments in the story.” According to the publisher, Cronin’s penetrating analysis details the challenges the economic transition of the 1970s and 1980s engendered as the United States and Great Britain together actively pursued their shared ideal of an international assemblage of market-based democratic states. He also addresses the crises that would sorely test the system in subsequent decades, from human rights violations and genocide in the Balkans and Africa to 9/11 and militant Islamism in the Middle East to the “Great Recession” of 2008. Cronin also is the author of The World the Cold War Made, New Labour’s Pasts and Industrial Conflict in Modern Britain, among other titles. Cronin talks about his book in this video interview with BC Libraries’ Elliot Brandow. This entry was posted in Boston College Authors and tagged America, foreign policy, History Department, politics, United Kingdom. Bookmark the permalink.